My name is Emma and I am 15 years old. I am a bit of a nerd but in my family, that is kind of a cool thing. I started shooting archery with my step-dad when I was eight years old. The first bow he bought me was a pink lemonade mini-Genesis and I thought it was SOOO cool. We shot at paper targets and 3D targets outside, even when it was too hot for normal people (my family is so NOT normal). In November of 2011, in my first JOAD class, a coach said “Hey Emma, why not try a recurve bow?” Now I am not sure those are his exact words but from the first time I shot with one of the JOAD program recurves, I was completely hooked. Now I shoot in all kinds of tournaments and in the local league with my recurve! 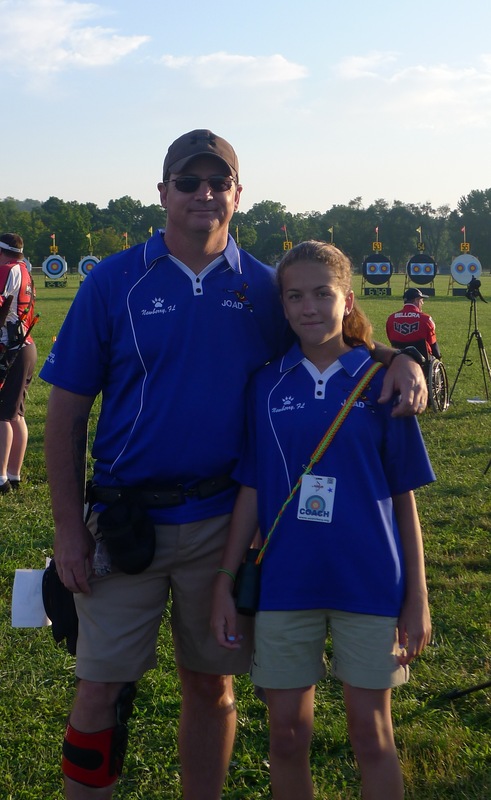 My step-dad is a disabled Army Veteran and is took coaching classes to become an USA Archery Level II coach so that he could help me on the line. Mom even started the classes too! My Mom makes fun of me sometimes because she says if she would let me, I would be shooting every single day. Some times it seems like I am but I don’t think that is a bad thing if you want to be good at something, right? Now we are one big archery family! I go to tons of tournaments which is an awesome experience. My goals now are to perfect the N.T.S. method and qualify to apply for the Junior Dream Team Camp by the time I turn 14. In case you are wondering, archery is pretty much my life. I do have a bunch of cats and one old dog that I like to spend time with and when foam is not my friend, nail polish definitely is. I love music and doing crafts, cooking and being awesome in general. I like watching Doctor Who, Elementary, The Walking Dead and Arrow. I hope you will come back to visit from time to time. Things will always be changing and new stuff is happening. If you have one, you can follow me on Twitter and Tumblr. I try to mix things up so you don’t get bored! Good luck with your archery! I took shoot tournaments on the weekends and I am hooked. Hi! My name is Koty. I ‘m 12, and I am in JOAD, too. How many arrows do you shoot a day to practice? It depends on the day, Koty. Sometimes I do my max, which is between 80-100, others I vary from 30-45. I have found that mixing it up helps me get stronger rather than wearing myself out too fast. Does that make sense?